The legendary musical "LES MISERABLES" has now been seen by over 54 million people worldwide in 38 countries and in 21 languages. "LES MISERABLES" remains one of the world's most popular musicals. 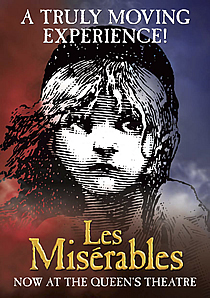 There have been 33 cast recordings of "LES MISERABLES", including the multi-platinum London cast recording and the Grammy Award-winning Broadway cast and complete symphonic albums. The video of the 10th Anniversary Royal Albert Hall Gala Concert has sold well over one million copies worldwide, making it one of the best-selling musical videos ever in the UK. There are over 1,500 productions of the Les Miserables School's Edition scheduled or being performed by over 100,000 school children in the UK, US and Australia, making it the most successful musical ever produced in schools. The Cameron Mackintosh/Royal Shakespeare Company production of "LES MISERABLES" by Alain Boublil and Claude-Michel Schoenberg is based on the novel by Victor Hugo, has lyrics by Herbert Kretzmer and music by Claude-Michel Schoenberg, with original text by Alain Boublil and additional material by James Fenton. "LES MISERABLES" is adapted and directed by Trevor Nunn and John Caird.